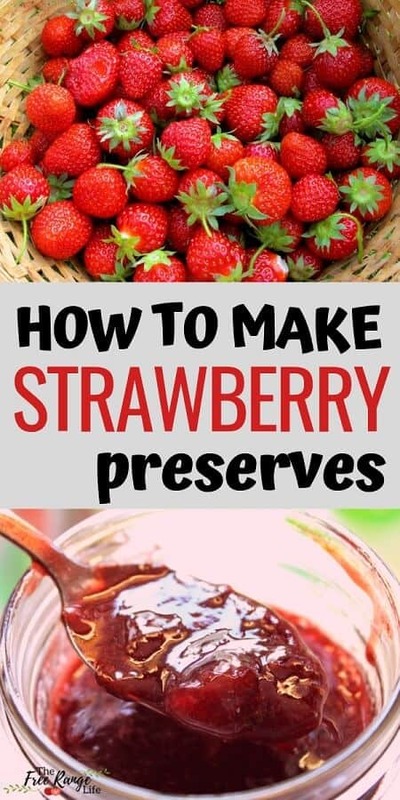 I love the taste of fresh strawberries and by making homemade strawberry preserves I can have that same fresh strawberry taste all year long! You may be wondering what the difference is between jam, preserves, and jelly. Many times they are used interchangeably, when they are actually different. Jelly is made using fruit juice. There are no chunks in jelly. Jelly is usually more transparent and has pectin to help it hold its shape. 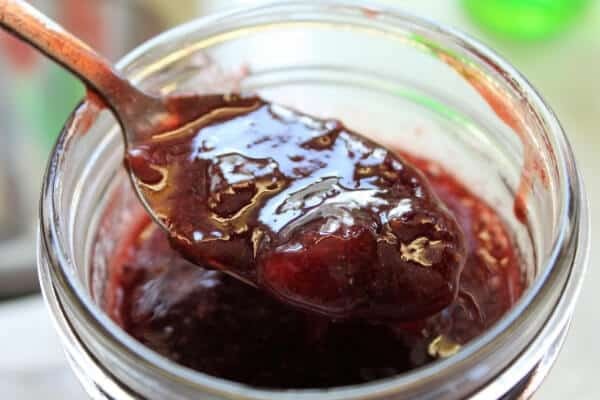 Jam is made using pureed fruit and usually has the addition of pectin. It is thicker than jelly with a more fruit taste. Preserves are made using whole or fruit chunks. The juice released from the fruit, mixed with the sugar, create a syrup/jam around the fruit pieces. Preserves don’t usually have pectin, as they are gelled in the sugar syrup. 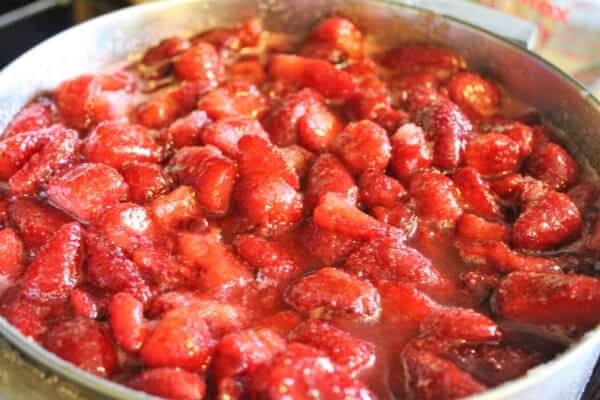 The following strawberry preserves recipe is so simple, it only has 3 ingredients! 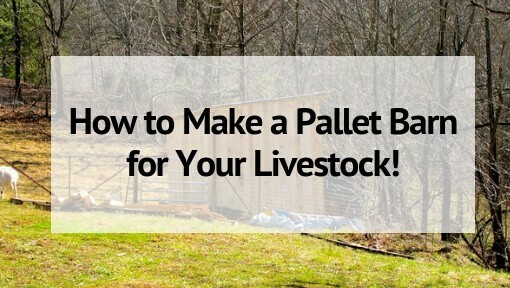 I’ve also included canning directions so you can enjoy it all year long! 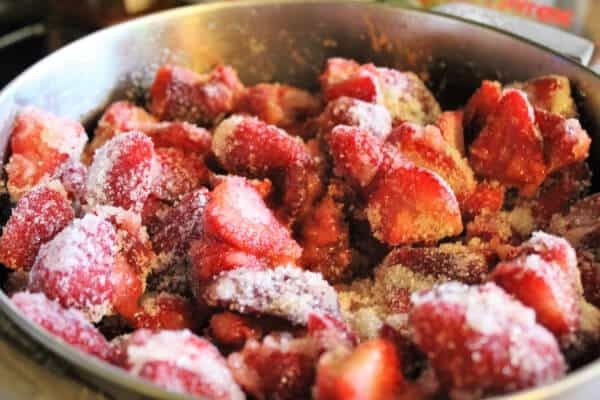 This recipe works for both frozen or fresh strawberries. 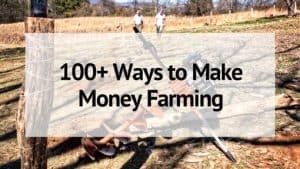 Sometimes it’s easier to just wash, cut, and freeze strawberries in the middle of harvest season and can them at a later date. I have made these preserves using both fresh and frozen strawberries and the result were the same. Step 1: Place your strawberries in a large pot and stir in the sugar and lemon juice. If you are using fresh berries you can let them sit in the sugar for a few hours first if you want. If you are using frozen berries go ahead and skip to the next step. Step 2: Turn the pot on to medium heat and bring the mixture to a boil. Stir frequently during this step to prevent burning. Step 3: Once the berries are at a rolling boil, turn the heat down to medium-low and simmer the berries, stirring occasionally, until the syrup has thickened and sticks to the back of a metal spoon. This step may take 15 minutes or so. When the preserves have thickened remove from the heat. 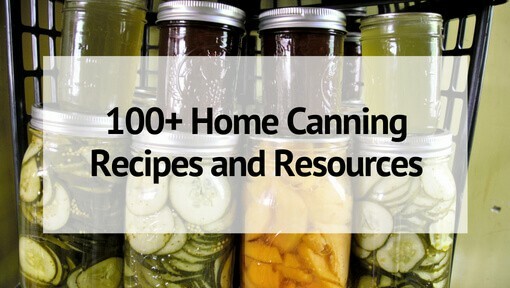 This easy recipe can be canned using the boiling water bath canning method. To can your preserves you will need a large canning pot with a jar rack. 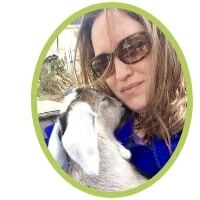 Since these are small half-pint jars, you can use a large stock pot as long as the water comes above the jars by about an inch and you have a rack to place in the bottom. 1) Sterilize your jar by running them through the dishwasher or washing in soapy, hot water. Keep the jars warm to prevent cracking when filling with hot preserves. 2) Fill your canning pot and turn the heat on to medium or high heat. 3) Fill your jars with preserves, leaving a ¼ inch headspace. Wipe the rims of the jars with a damp cloth and place the lids and bands on the jars, tightening finger tight. 4) Place the jars in your canning pot so that the water comes at least one inch above the jars. 5) Process (boil) the jars for 5 minutes. Start your timer when the water begins to boil. 6) After 5 minutes, turn the heat off the canning pot. Wait about 5 minutes before removing the jars. 7) Place the hot jars on a towel, in a draft free area where they will not be disturbed. Allow them to sit overnight or for at least 8 hours before checking for seals. You should hear the “ping” of the jars sealing. 8) Check your jars for proper seals by pressing down in the center of the lid. If the center can be popped up and down, your jar is not sealed and should be refrigerated. These strawberry preserves should last at least a year in proper conditions. Wipe the jars clean, remove the bands, and store in a cabinet or pantry. Be sure to check the seals again before opening. 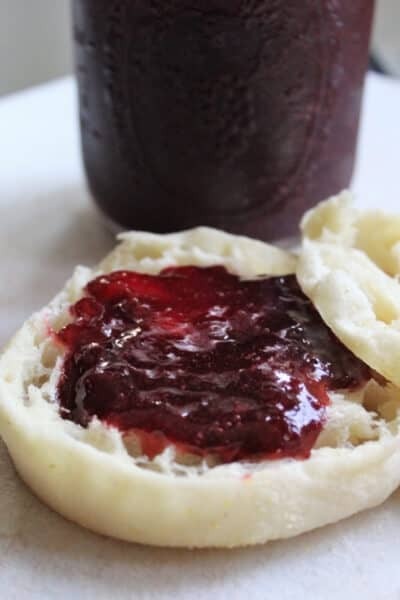 This jam goes great on homemade buttermilk biscuits!